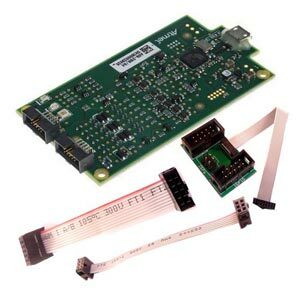 Below are the products which we stock from Atmel. It has all the function of expensive boxed versions but is much cheaper. and Kanda have included an adapter board with this version to convert to 6 and 10-way ISP and 10-way JTAG..
CMOS RISC, 8-BIT AVR ATtiny2313 Microcontroller, In-system Programmable with Flash code storage, EEPROM, re-programmble up to 1000 times.